A yoga handstand is an advanced yoga pose that can take some time to master. Whether you are intermediate or advanced, you can work toward a full handstand with a few helpful tips. 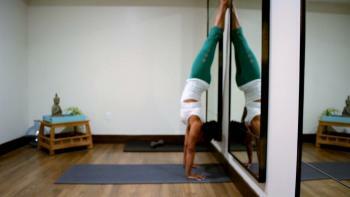 There are several ways to get into a yoga handstand. These variations are ordered from easiest to most challenging. Do not attempt a yoga handstand if you are brand new to yoga or have never attended a yoga class. Begin in downward dog, abdominals engaged and hands firmly planted. 1. Step one foot to the center of your mat, heel high, knee bent. 2. Lift the other leg up as high as possible. Make sure to keep your hips square and engage your inner thighs. 3. Bend the knee of your base leg then push off the ground with as much force as you can until your other leg hits the wall. 4. Squeeze both legs tightly together and lengthen your spine. 5. To return to the ground, gently release one leg toward the floor. The other will follow. 6. Land with your knees bent. Rest in child's pose for a few breaths before you try it again. Begin in a wide legged forward fold with your hands on the mat in front of you. Make sure your shoulders and abdominals are firm and strong. 1. Lift your heels high up off the floor. 2. Bend your knees a few inches, then spring off the floor until your backside hits the wall. 3. Bring your feet together in the center, squeezing your inner thighs and lengthening your spine. 4. Return to the floor by straddling your legs and coming out the way you came in or by releasing one foot at a time. Rest in child's pose for a few breaths, then try it again. This variation is the most challenging of the three. Lift your heels high up off the mat and bend your knees deeply, drawing your hips toward your heels. Hop your lower body forward and up until your hips are over your hands or they hit the wall. Straighten your legs, squeeze your inner thighs together, and lengthen your spine. To return to the mat, release one leg at a time. Follow these steps to begin practicing your yoga handstand. For best results, attend an intermediate vinyasa or power class. If you're serious about achieving a yoga handstand, contact your nearest yoga studio to see if they offer one-on-one sessions. Your instructor will be able to spot where your strengths and weaknesses are and help you work on them.